JNN 23 Jan 2014 PESHAWAR : Fighter jets bombed suspected Taliban hideouts in a tribal area on the Afghan border on Tuesday killing at least 40 people, military sources and residents said, after a wave of insurgent attacks against security forces. It was the first time the air force has resorted to aerial strikes in the volatile region since it struck a ceasefire agreement with local Taliban chiefs in 2007. Aerial strikes also took place in the nearby tribal region of Kurram. Pakistani military sources in the army headquarters in Rawalpindi put the death toll at 40, all of them militants. A military spokesman told 15 Terrorist had been killed in the onslaught. The military said those killed were linked to bombings in a bazaar and a church as well as Sunday’s attack in Bannu that killed 20 soldiers. Villagers described scenes of panic as fighter jets and helicopter gunships pounded the Mir Ali area, sending villagers fleeing from their homes into the cold to hide. Residents of North Waziristan who have given refuge and shelter to the Taliban and Foreign Al Qaeda Terrorists , a lawless mountainous region where many al Qaeda-linked militants are based, repeated the same version the Taliban have given against the Attack on their terrorist Hideouts , as claiming that there were numerous civilian casualties but the Pakistan army has denied such reports , as the attack was precise and Information based , and the Civilian Causality was minimal in the performed operation. Sharif has been under pressure from the Patriot Pakistani Civilians and hawks within the Pakistani army to take tougher military action against Taliban militants. The air strikes took place as pressure grows on Prime Minister Nawaz Sharif to take tougher action against the Taliban following the attacks. The Pakistani Taliban are terrorizing the Nation to topple the central government in Islamabad and impose Saudi styled Wahabi rule in the nuclear armed South Asian nation. “We strongly condemn this cowardly act which they (Pakistan army) carried out under cover of darkness, targeting sleeping people,” said Pakistan Taliban spokesman Shahidullah Shahid. Sparking speculation that a military operation was imminent, Sharif canceled his trip to the World Economic Forum in the Swiss resort of Davos on Sunday following a Taliban attack on an army convoy in which 20 soldiers were killed. “This hadn’t been planned before, and Pakistan air force fighter jets were called to hit hideouts of the militants involved in attacks on security forces,” said one military official who spoke on condition of anonymity. 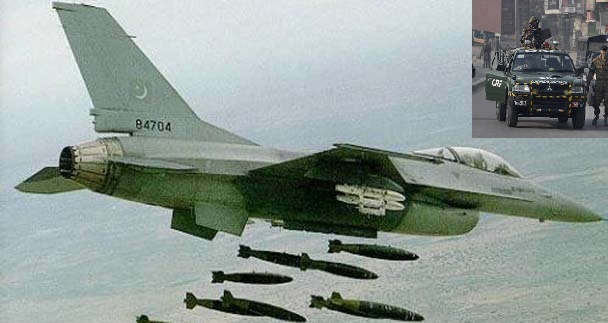 Military officials said fighter jets were targeting only militant positions around the Mir Ali area of North Waziristan. Following a wave of fighter jets strikes, the army later called in helicopter gunships to shell suspected hideouts. Residents said bombardment started overnight without any warning. Earlier, tribal elder Malik Jan Mohammad in the Mir Ali area had said 15 people were killed. A Taliban source put the death toll at 27, including civilians. “We were all asleep when the planes started bombing the village,” said Khyal Zaman, a tribesman from the village of Esori. Despite Sharif’s emphasis on peace talks, attacks have continued unabated since he came to power, a worry to regional powers already anxious about security as foreign troops prepare to pull out from neighboring Afghanistan this year. Sharif, who came to power under the Saudi Backing , and promising to make peace with the Taliban through talks and not military action, But as now the Wahabi Taliban has crossed every barrier of terrorism ,and have not spared people from any walk of life , Whether it may be Doctors , Writers , LEA Personnel ,Barelvi , Sunni or their Most targeted Shia Community People . And as Now with the change in the Pakistan Army Brass, and General Raheel Shariff , who came under severe Pressure from the Pakistani Nationals and specially from the LEA Personnel , that how long they will be killed like Sitting ducks and could not respond and give the Answer in the same Language which they speak and Understand. That is give the answer of every action with the same force . No meaningful talks have taken place for years. As the Agenda of the Taliban is only Dis Integration of Pakistan By creating anarchy and Chaos in the Country. With The death of the Previous Taliban chief Hakimullah Mehsud in a November drone strike, The Leadership of the Tehrik e Taliban Pakistan coming to its new leader, Mullah Fazlullah, who has stepped up his campaign against the army. This entry was posted in Asia Pacific, Pakistan News, Parachanar and tagged Fighter jets, Foreigners, Pak Armed Forces, taliban, Tehrik e Taliban Pakistan TTP, the Taliban, TTP. Bookmark the permalink. BUT HOW MANY INFIDELS KILLED , THAT IS MORE IMPORTANT .